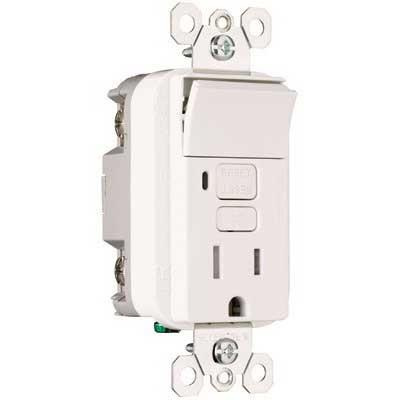 Pass & Seymour 1-Pole 2-Wire Tamper-resistant decorator combination straight blade GFCI receptacle in white color, has current rating of 15-Amps and voltage rating of 125-Volt AC. This receptacle with back-wired connection, accommodates solid/stranded copper wire of size 10 - 14-AWG. It has high-impact-resistant thermoplastic. Receptacle has NEMA 5-15R configuration. Receptacle is screw mountable. Patented shutter system of this receptacle helps to prevent improper insertion of foreign objects. It has SafeLock protection and prevents line-load reversal miswire. Receptacle has two back-wire holes per terminal. It measures 4.2-Inch x 1.72-Inch x 1.13-Inch. Receptacle is UL/cULus listed and meets FSUL standards.